It wasn't until the early 1900s that researchers figured out how to attach small particles of silver to proteins, thereby allowing the formation of a true Colloidal Silver with a practically indefinite shelf life. This was an invention, that some people view, to be as big as the invention of penicillin. By the 1940s the discovery of antibiotics put this useful potion on the back-shelf but it has enjoyed a revival since the 1990s as more and more people search for alternatives to antibiotics for more minor problems. 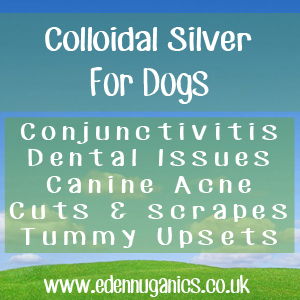 Colloidal silver can be used in the treatment of a huge range of ailments and is beneficial to both humans and canines alike. Dogs can benefit from colloidal silver in a number of ways. Its antibacterial properties make it a great addition to your pet's diet following an upset stomach. In addition, it can be applied to any cuts or grazes to help keep them clean and infection free. Colloidal silver also helps your pets to eliminate parasites and shield it from unwanted viruses making it great for maintaining the general health of your pet. Cuts and scrapes - Apply Colloidal Silver directly to the wound or graze, if you are applying a dressing (wrap or bandage) apply a little colloidal silver to the dressing as well. Colloidal silver will not react with other medications meaning it can be used in conjunction with other antiseptic creams and ointments. Canine Acne - It's not just us humans that are prone to problematic skin, dogs also suffer from acne and spots. Using a small piece of cotton pad, massage a small amount of colloidal silver into the problem areas two to three times a day. Conjunctivitis - To treat conjunctivitis simply drop 2 to 3 drops of colloidal silver water into the eye of your pet 2 to 3 times a day. This also works for humans and is used with great success so well worth a try. Ear Infections - For ear infections place 3 to 5 drops of colloidal silver into the ear canal of your dog using a dropper. It is best to do this at least twice a day. The next step is to gently rub the ear in a circular motion, then remove your hand and let your dog/cat shake its head. You can use a cotton ball to gently wipe any excess liquid from the inside of the ear flap. In addition, swab the inner-ear flap with colloidal silver once or twice a day. Dental Issues - Spray colloidal silver onto a toothbrush and brush your dogs teeth daily without the use of water. This helps your pet in a number of ways. Bacteria like to breed in warm, damp conditions and your dog's mouth is just about perfect for them to make a home. Brushing with colloidal silver daily will help to reduce bad breath issues as well as improve general oral hygiene and possibly avoid the need for anaesthetic later in life as sometimes dogs need to be put under to have their teeth cleaned. Tummy Upsets - Tummy upsets and pets are never a good combination yet, colloidal silver can be a great tool for reducing the symptoms and speeding recovery. Simply add around a teaspoon of colloidal silver to your pet's water bowl 2-3 times a day for a couple of days whilst the problem persists. Can I Give My Dogs Colloidal Silver?